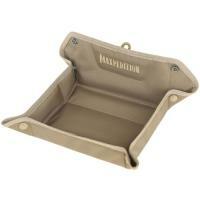 Keep track of gear with the help of the FTV Folding Travel Valet from Maxpedition. Designed to prevent travelers from losing valuable, the folding valet offers a transportable surface that keeps items secured in one place. Whether riding on a train or a plain, instead of placing loose items on the tray where they can be forgotten, knocked off or lost, use this convenient carrier. The FTV can be laid flat or used in a bi-fold style, then when it is time to leave just grab the carrier and get out. It is perfect for times when you fall asleep or get into a project and your stop sneaks up on you. When not in use, the travel valet lays flat and is easy to pack.